Seems the Banksters lost and Bloomberg won as the Supreme Court refuses to hear the Federal Reserve Appeal on releasing the names of banks who received loans during the financial crisis. 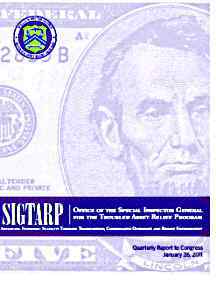 The Treasury revised the losses on TARP to $89 billion. The March budget deficit was $65.4 billion. The Wall Street Journal claims the TARP costs include Fannie Mae and Freddie Mac. That's simply not true, Fannie and Freddie received a separate, unlimited bail out. The last loss projection was $400 billion dollars. If one notices, Freddie Mac and Fannie Mae are woefully absent in any financial reform legislation as well. Is This Change We Can Believe In? Read more about Is This Change We Can Believe In? Bank Bail Outs Proved to be "inside job"
What a surprise, it's not what you know, but who you know especially if you want billions in free money to cover your screw up. A new study from University of Michigan Professors Ran Duchin and Denis Sosyura found that the financial institutions who has the strongest political "ties" received the largest bail outs. Duchin and Sosyura focused on the Capital Purchase Program, the largest TARP initiative in terms of the number of participants and the amount of expended capital. As of late September, nearly 700 financial institutions had received about $205 billion under the program. Read more about Bank Bail Outs Proved to be "inside job"
The Obama administration is extending TARP to 2010. Treasury Secretary Timothy Geithner plans to tell Congress that the Obama administration will extend the $700 billion financial-rescue program until next October, according to people familiar with the matter. While the Troubled Asset Relief Program expires on Dec. 31, Geithner can extend it by notifying Congress. A letter notifying Congress of the extension could come as soon as today, said the people, who declined to be identified. Andrew Williams, a Treasury Department spokesman, declined to comment.